﻿ Happy Valhallentine’s! We’re celebrating the season of love with new treats, like new Skins for Zariel and Ada, a new Podium, and so much more. The Celestial Chest has also appeared with three exclusive Skins, and we’ve updated our roster of Doodle Avatars as well. Additionally, there’s bonus login Gold for the event, an updated Brawl of the Week, and more! These colors are sure to be a KO with their pink, red, and white colors. Purchasable with your hard-earned Gold! Valhallentine will also feature a UI Takeover and +250 Gold per login! The Celestial Chest has appeared and comes with exclusive Skins for Artemis, Kor, and Koji for a limited time! Three exclusive Skins: Seraph Artemis, The Korinthian, and Emperor Koji. Inspired by radiant colors and ethereal beings. Show off your divinity with these exclusive Skins! Find Valhallentine items by following the candy hearts in Mallhalla. Featuring new Doodle Avatars for the most recent Legends! For a limited time, the Celestial and Sunken Chests are available with exclusive Skins! Get the team together for this 3v3 game! Don’t have a team? Fear not, we’ll find one for you! Hit the Coliseum, snag the ball, juke or pass past your opponents, and hold it in their goal to score! No team damage, and you can go through walls the same color as you. First team to 3 scores wins! Queue up solo or with a team! Reduced number of unique textures stored in memory for the XO KO to improve its graphic performance. There are no visual changes in animation. Fixed a visual bug on the Winter Wonderland Podium where the train would appear to move behind the podium around corners. 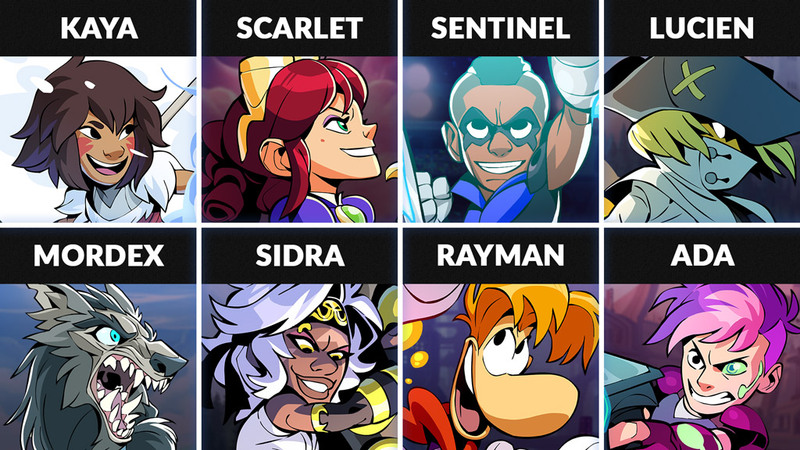 The new Legend rotation for this week includes: Kaya, Scarlet, Sentinel, Lucien, Mordex, Sidra, Rayman and Ada. Kaya – Using her bow, spear and spirit animals, she is ready to try her luck in the Grand Tournament! Scarlet – A former female boxing champion of England and head of the Royal Airship Navy, this Legend uses her ingenuity and steam power to build her own Rocket Lance and Grappling Hammer to take into battle. Sentinel – The first and greatest costumed superhero in America has come to Asgard, finding those who need protecting and vanquishing injustice with his Katars and Grappling Hammer. Lucien – This mysterious highwayman is always scheming for gold, and now has come to Valhalla to take part in the tournament wielding Katars and Blasters! Rayman -The Champion of the Glade of Dreams, wielding his Gauntlets and Axe, has found his way into Valhalla on a mission to save his home.